Among the first plantings in the valley was Gewürztraminer at Husch, in 1971. Navarro began planting in 1974, and in 1980, Allan Green planted Riesling at Greenwood Ridge. Thankfully, Pinot Gris, Muscat and Pinot Blanc also found a welcome home here in this bucolic vineyard reverie. 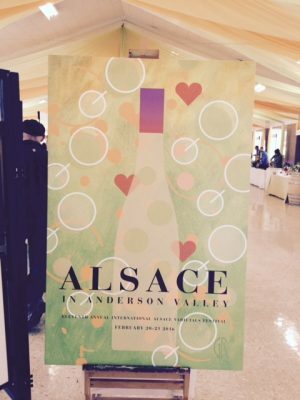 In 2005, it was time to celebrate the Valley’s Alsatian roots. Now in its 11th year, The Alsace Festival is a great excuse to stick your nose into glass after glass of sheer aromatic joy. 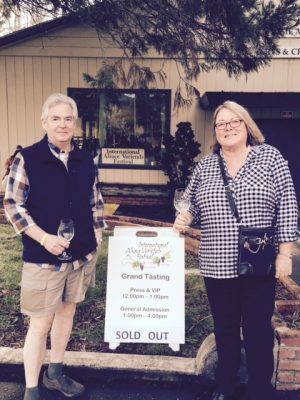 From Anderson Valley to New Zealand, from Santa Barbara to Long Island, we tasted some zesty, floral and exciting Alsatians, and thanked the winegrowers who refused to abandon ship on these aromatic ancestors when the tide turned to Chardonnay. 2014 Barra Muscat Blanc, Mendocino – Just a hint of sweetness in this brazenly floral beauty offsets the equally brazen acidity, making this beverage one you can enjoy as an aperitif or a grande finale on a summer evening with candied ginger or almond biscotti. 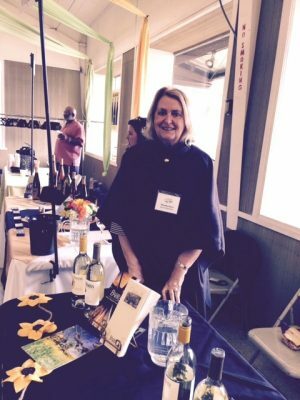 2014 Bink Pinot Gris, Filigreen Vineyard – Winemaker Deb hasn’t made Pinot Gris in 5 years, but this biodynamic vineyard did her proud. Intensely juicy and mouthwatering, this is pure peachiness. 2014 Cartograph Riesling, Greenwood Ridge Vineyard – Beautiful aromatics with violets and petrol, lead to lime-zesty zippy acidity and a fragrance you can taste. 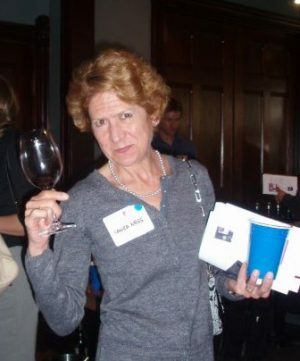 2011 Elke Vineyard Pinot Gris – Elegant as Catherine Deneuve in a white gown and sparkling diamond chandelier earrings, this is classy and classic. Mary Elke has a few cases left. Don’t wait! 2014 Girasole Pinot Blanc by Barra – Knock me over with a feather, this $15 lovely is worth every penny for its generously textured white peach core, dripping with fresh nectarine and lime zest. Succulent! The Barra’s are planting more. 2014 Handley Pinot Blanc and 2014 Pinot Gris, Anderson Valley – It’s almost impossible to choose between these two, so the best plan is to get one of each. The Blanc is slightly softer and creamier with a hint of tropical, while the Gris is zesty and spicy, packed with mouthwatering white nectarines and grapefruit. 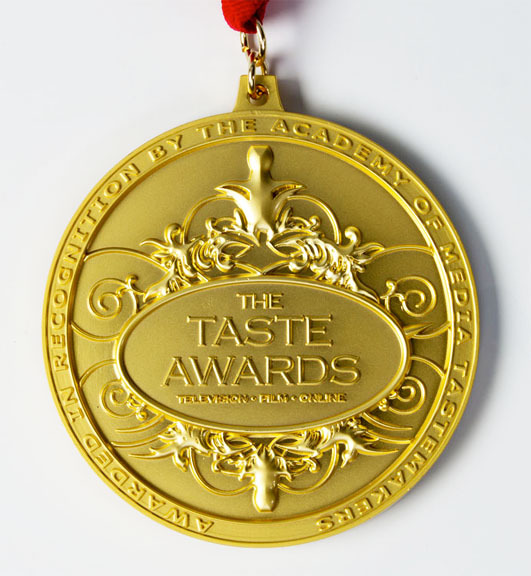 2014 Maidenstoen Coast View Riesling – Mike Callahan is a rising star of Riesling who respects the varietal enough to leave it alone and not mash the bejeezus out of it. He is careful not to press the thick-skinned fruit too hard: he wants to avoid excess tannins. But he does allow some lees contact, and leaves about 2% RS to balance out the kiteflying lime-o-licious acidity of this particular vineyard. Just a stunning wine, as is his Zabala Vineyard effort. He, like Ryan Stirm of Stirm Wines, makes Riesling alone. God bless them! 2014 Lula Cellars Gewurztraminer – From Redwood Valley, this is highly perfumey, exuding decadent roses and alluring lily of the valley, with a hint of ginger. On the palate, it’s exotic with hints of coriander, nutmeg and lemongrass. A perfect spicy food companion. 2012 Panthea Gewurztraminer, Helluva Vineyard – Heady and very complex, this wine intrigues with notes of jasmine, white peach, pear and a finish of crème brulee. Divinely textured and extremely long of finish and impression. 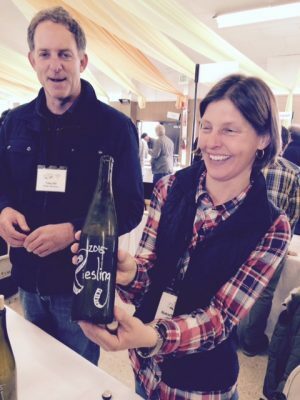 2015 Philips Hill Riesling – Although winemaker/owner Toby Hill, took the time to decorate the bottle of the tank sample he pulled, this brazen newbie wine speaks for itself, precisely hitting all the notes in the upper register. 2014 Toulouse Pinot Gris – Another lipsmackingly juicy and delicately delightful effort from this ebullient local producer with the loose goose on the label. The fruit comes from Valley Foothills Vineyard in Anderson Valley. Their Gewurztraminer is also gorgeous, with grapefruit and orange zest on the finish. 2014 Domaines Schlumberger Pinot Gris, Alsace – Lovely fluid texture of peach and nectarine embues this svelte charmer with the most lively and assertive finish. From the largest vineyard in Alsace. 2012 Lois SIPPS Riesling, Alsace – From an estate that has been making wine for four generations, this beauty makes a statement about balance, balance, balance. Not a foot put wrong on this tightrope walk of pleasing fruit and acidity. 2014 Lazy Creek Gewurztraminer — Lots of pretty floral notes here. 2014 Philo Ridge Gewurztraminer — A spicy, well-textured effort from the Ferrington Vineyard, Anderson Valley. 2014 REIN Pinot Blanc and Riesling (Greenwood Ridge) – Lees contact and neutral oak make these native yeast fermented wines a paragon of textural interest. Both convey a distinctive vein of marzipan. 1991 Greenwood Ridge White Riesling – Poured at the winemaker’s gathering on Friday evening, this was positively the hit of the night, golden as the last rays of a summer evening and filled with rich flavors of honey-apple galette and ginger biscuits. Thanks to winemaker Allan Green for hanging onto a few bottles of this grand dame. Snag a few bottles of the 2014 and stash them. 1997 Thomas Fogarty Gewurztraminer – Baked peach cobbler with apricot marmalade and crème brulee on the finish. The current release, 2014, will probably get there. 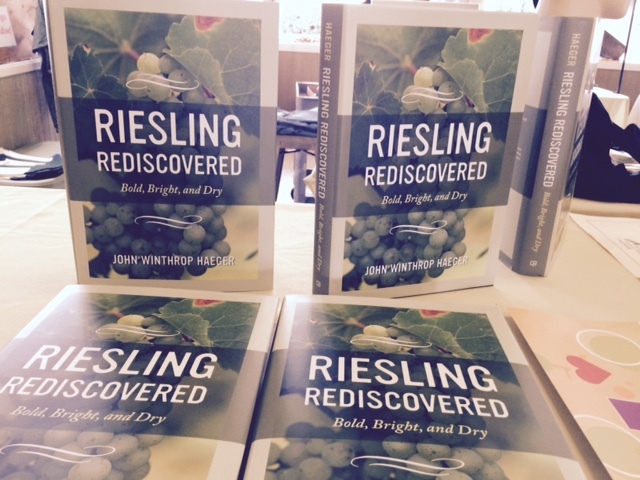 NOTE: Lovers of Riesling should check out John Winthrop Haeger’s “Riesling Rediscovered,” available on Amazon. He was in attendance, discovering new adventures, bold, bright and dry.